You could see 100 photos of Italy’s Cinque Terre, but until you witness the terraced rows of pastel homes and sparkling sea below, you won’t understand how beautiful it really is. Here are some of the best ways to see it yourself from Rome. Leave when Rome is still waking up to embark on a full-day journey of adventure along this rugged portion of the Italian Riviera. Arriving by train, you’ll spend the day hopping between Cinque Terre’s seaside towns either by train or by boat, depending on the season. Visit the villages of Manarola, Monterosso, and Vernazza, where you’ll have some time to explore on your own in addition to the informative guided tours. Stroll past castles, along ancient walls, and down narrow, cobbled alleys—if, of course, you can stop yourself from snapping photos of the colorful buildings and coastal scenery. 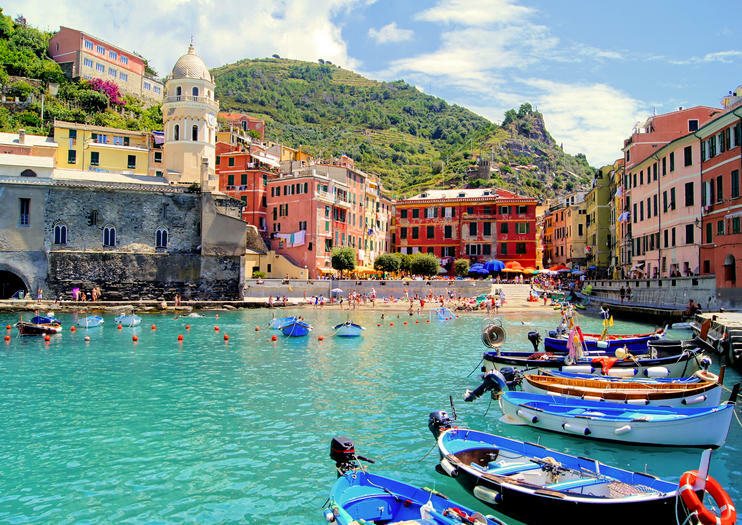 Many multi-day tours of Tuscany include a day exploring the coastal villages of Cinque Terre. You likely won’t spend the night in one of the villages, but rather visit from La Spezia or Pisa. Hop between villages, enjoying a couple of hours in each to photograph viewpoints, wander the streets, and dine at a laidback, oceanview restaurant where you can smell the salt on the breeze while you savor ultra-fresh seafood and other regional specialities. By high-speed train, it’s about 3.5 hours from Rome to Manarola. Day trips typically usually leave from Rome around 5:30am. The villages of Cinque Terre are set on a hillside. Visitors should have a moderate degree of fitness and comfortable walking shoes to walk around the towns. In winter, travel between villages is done by train; in summer, it’s often by boat. Multi-day tours usually include an overnight stay in Florence or La Spezia. All tours include free time to explore and enjoy the villages at your leisure.